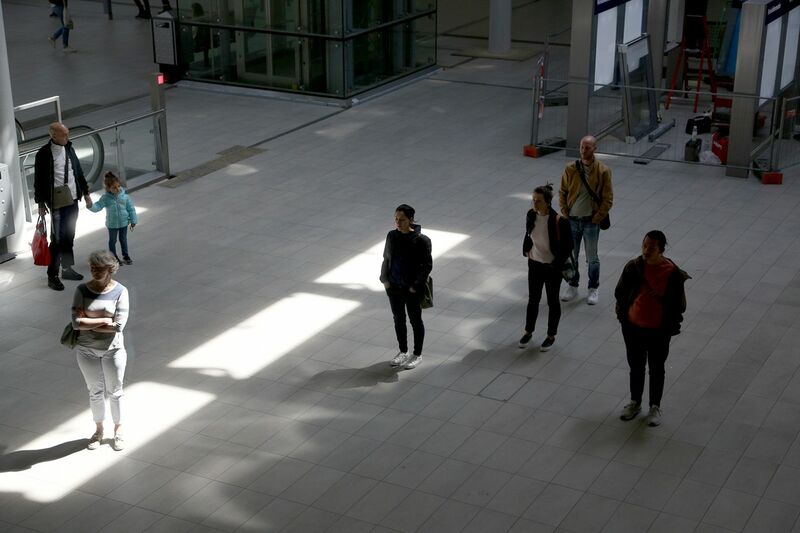 The single screen video is a reconstruction of the performance with the same title that was performed during half a year, 786 hours, on working days, at Utrecht Central Station in 2016. 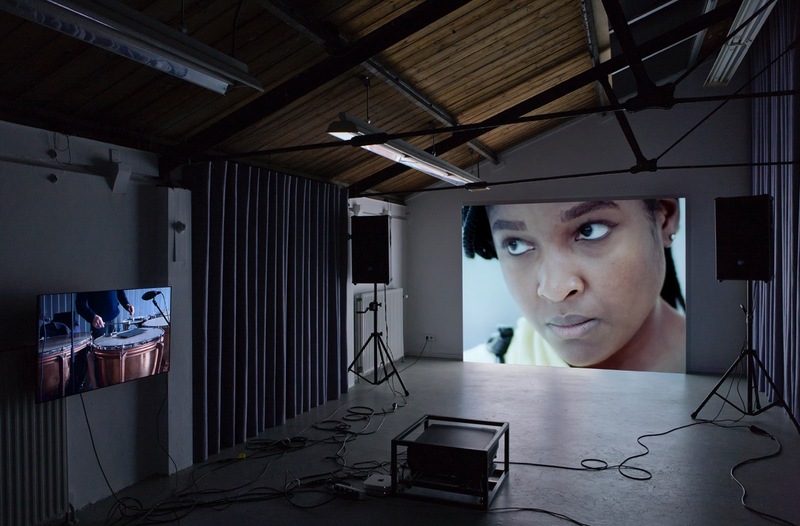 Documentation of the performance is not filmed by the artists but edited solely out of material found online. At How can we know the dancer from the dance? four performers were present daily, during half a year, among the crowds of people thronging through the station. 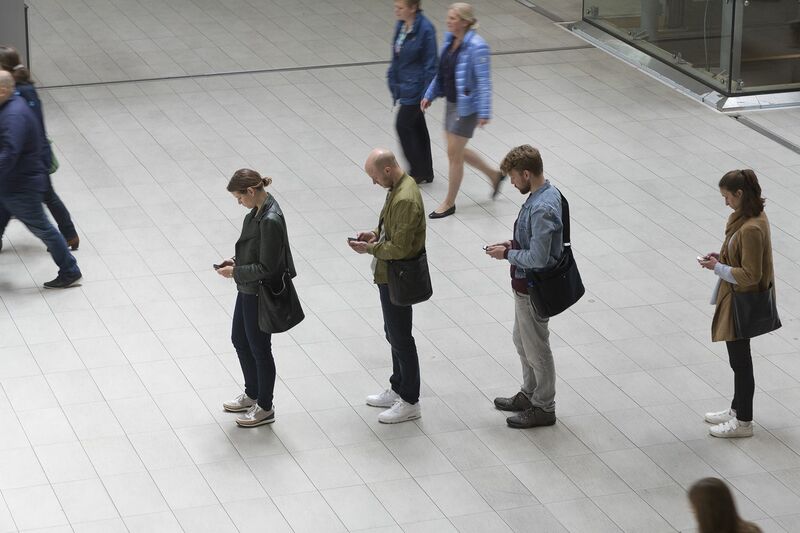 These performers did nothing to stand out in the crowd, in fact they behaved exactly like everyone else: taking a sip from a paper coffee cup, checking the news on their phone, or just ambling around aimlessly, waiting for a friend to show up. Only they did so all four at the same time, in perfect synchronicity. 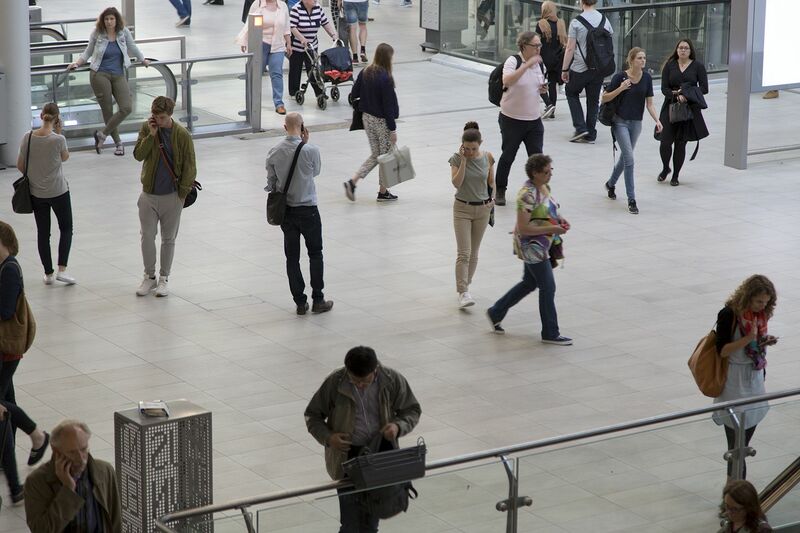 This synchronous choreography of everyday movements is based on a large video archive of behaviour at that same station. The scenes selected from this extensive study of body language where copied until the last detail in a month-long rehearsal process, giving the performance a documentary quality but also a richness of information that can only come from the density of reality. It is grounded in the idea that which surrounds us every day, which we find boring and normally don’t notice, can actually teach us a lot when taken a closer look at. The performance was consciously not publicised, it had to be individually discovered by the audience. The spectators at the station stood still and watched because they noticed something, not because a sign or booklet told them to do so. People that walk through the group of actors without having noticed the performance, unconsciously become an extra actor. With a minimum of means, a theatrical space is created where it is least expected. How can we know the dancer from the dance? infiltrates in the environment, subtly and subversively changing the behaviour of the passerby.